Roma Downey may not be an angel, but she’s played one on TV. Still recognized for her work as the heavenly being named “Monica” on the popular 1994-2003 television series, Touched by an Angel, the Irish actress has long been associated with these “messengers of God.” And her newest endeavor continues in that realm with stories she hopes will entertain, instruct and even uplift a smaller, yet quickly-growing audience. 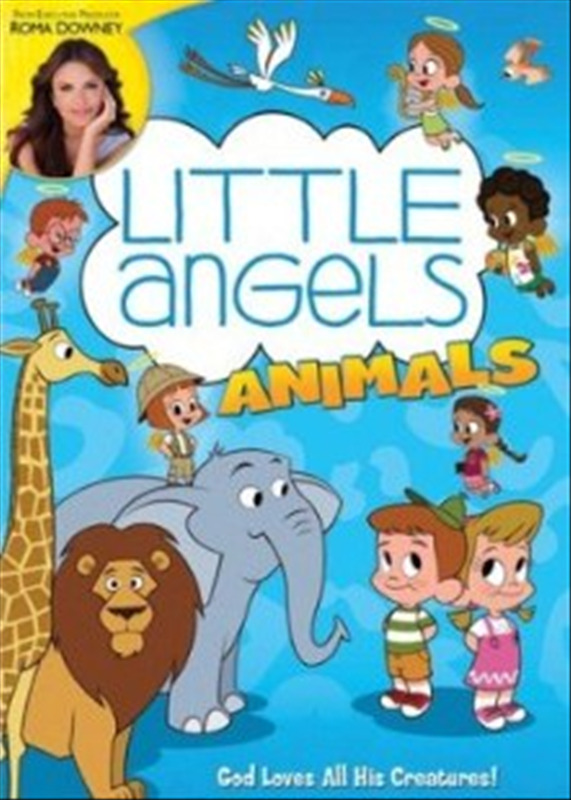 Designed exclusively for preschool-aged children, Little Angels is an animated, educational DVD series, executive-produced by Downey, which introduces 3-to-5-year-olds to spiritual, moral and ethical principles of the Bible while also helping them learn practical life skills. Already awarded a Seal-of-Approval from MOPS (Mothers of Preschoolers), the first two DVDs in the series release from Twentieth Century Fox Home Entertainment on November 1, 2011. In both Little Angels ABC’s and Little Angels Animals, children meet two new friends—busy preschool twins Alex and Zoe—and the eight little angels who help them learn some important life skills through the telling of age-appropriate Bible stories. By day, the angels are merely paintings in a mural on the ceiling of the children’s nursery in their home. But when Alex and Zoe need them most, the angels come to life and descend into their world and help make sense of the challenges facing the young children. Some of the angels do hearken back to biblical archangel counterparts, but all are characterized with their own personalities and responsibilities in order to help Alex and Zoe in learning different lessons in their growth process. As the leader of the “eight little angels to shine God’s light,” Michael is supremely knowledgeable and has a commanding presence. Gabriel is the messenger angel and takes on the role of making announcements, while Dina is the angel of learning and carries a little iPad. Ariel protects with a small sword that can grow into a sword of flame, and Uriel carries a palette and paintbrush to aid in creating things. The angel of wild animals, Hayley teaches everyone their names and how to treat creatures with kindness, while Ham’s Sherlock Holmes’ type of cap and cape help identify him as the angel of logic. Rounding out the group, Charlie is the angel of harmony and brings everyone together with her harp and an accompanying song. Recently I spoke with Downey about her role as Executive Producer of Little Angels and why she feels this new series—which she wishes had been available when her own kids were younger—can be a great supplement for parents who desire to teach their children biblical truths and life skills in a fun way. Where did the concept for Little Angels come from? Was it inspired by your previous work on Touched by an Angel? Well, you know my work on Touched by an Angel was such a privilege for me to be playing the angel Monica. I got to be the messenger. The message, of course, each week was central to every episode and was that God loves you. And I thought, “Wouldn’t it be marvelous to have a project that was able to bring that same message this time to our preschool audience?” So it’s an animated preschool DVD series called Little Angels. And it’s been designed exclusively for this preschool child to teach them practical learning skills: ABC’s, 123’s, and so on. And it introduces them to spiritual and moral principles of the Bible. I’ve designed it in a way to engage parents to teach their kids timeless Christian values. And it’s fun, and it’s funny, and it’s colorful and they have great music. We have great characters. It’s compelling. It’s good storytelling. [In each episode] we have a set of friends: Alex and Zoe. They’re just four years of age, and on the ceiling of their nursery there’s painted a mural with eight little angel characters on them. When the mom and dad aren’t around, the little angels come to life and they fly down and they act as teachers and guides and counselors for the children. And each of the angel characters has a really distinct and cute and funny personality, and they each have a sort of special gift that they bring. And one of those angels is the angel of creativity and his name is Uriel. And he always shows up with a canvas and a paint brush. And what this does, it allows the device where we’re able to have our children time-travel because Uriel paints a picture and the kids, as if in a dream, go with the angel into the picture and they end up back in the time of the Bible. And so, for example, one of our stories is that the boy cannot tie his shoelaces. He wants to just put on his Velcro shoes. He thinks that would be much easier and the angels encourage him not to quit. They say if you just quit and everybody did that, nothing would ever happen. Consider Genesis 6:9-22 . . . if Noah had just quit. And then the little boy looks puzzled. “Who’s Noah?” And so Uriel, the artist angel, paints a picture of the Ark and the angels take the children into the picture and now they’re back in the time of the Bible with Noah himself who’s hammering away at the Ark. And Noah explains to them that there is many a time he wants to quit ‘cause there isn’t a rain cloud in the sky and all of his neighbors are making fun of him and ridiculing him and saying how stupid he was. And he knew he had to stick to it because first of all God himself told him to do it, and he trusted God. And next thing you know the rain comes in and, of course, the children get to see that Noah was able to save all the animals two by two. And as the flood rises the little waves take the kids back through the picture back into the floor of the nursery, and the angels say to the kids, “Do you see? If Noah had quit, the animals wouldn’t be saved.” And the little boy says, “I get it.” And he picks up his shoe, and he puts it on and he starts trying to tie his shoelace. And so they’ve learned a couple of things. They’ve learned the story of Noah. And you and I both know that in this age group kids are so impressionable. Stories learned at this age will resonate with them their whole life. I’m very enthusiastic, as you can tell. I’ve been working on this for about 18 months, and I’m so excited ‘cause we’re just bringing it out into the Christian market and we’re going exclusively into [the Christian marketplace] through February with two DVDs: Little Angels ABC’s and Little Angels Animals. We also have CDs, some fantastic music, and in February we go wider. We’re going to Walmart, and we’ll be introducing at that time a couple of books that Ideals are publishing for us. And we’ll be adding a third DVD to the collection and that will be Little Angels 123’s. 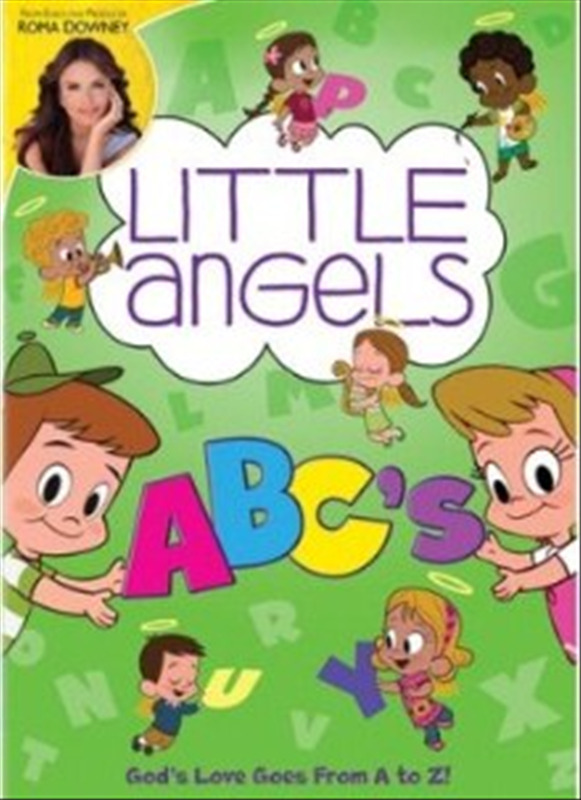 How closely did you work with Little Angels director/writer Phil Lollar on this DVD series? First of all I should just say that we’re thrilled to get Phil Lollar on board. I’m sure your readers know him from Adventures in Odyssey. He’s a great writer. He brought not just his faith and his talent to our project, but his great sense of humor. You know I knew early on that it’s one thing to have just good intentions with this audience, but if we hadn’t presented it in a package that was fun and funny and compelling and engaging that the kids just wouldn’t watch it. So Phil Lollar was key here in creating the stories and helping to flesh out these ideas for characters and so on. He’s been just heaven sent to us, and we’re just so thrilled to have him. Do you think that having Alex and Zoe be preschool children will help the preschool children who are watching the DVDs be more engaged with the subject matter they’re learning about? I think so. And I think also in terms of design, you know. First of all, they’re experiencing. Kids tend to relate to characters, so clearly we have a little boy and a little girl to cover our bases. They’re dealing with all the challenges that any preschooler will have to deal with, and so I think we’ve created very relatable characters for a preschool audience. But I also think in some ways because of the design elements of our Little Angels characters, they’re also cute and appealing. They’re dressed in contemporary clothing. Dina, who’s the angel of learning, carries a little iPad with her which all the kids have really responded to. I think that’s very cute. And you know because of their unique personalities my hope is that every kid watching will have a unique personality [to relate to]. We’ve tried to cover a whole range of types of character in the angel personalities, and I would imagine that kids will identify you know with one more than another. To that end, we’ve set up our Web site, www.littleangels.com and we also have our Little Angels Facebook page. And what we’re starting to do on Facebook is to have a page for each of the angel characters. And I think that as the series takes off and people start to discover it, it will be a fun thing to jump in there and find your favorite little angel. And we’ll continue to update the postings on our Facebook page. Talk more about the “Life Lessons” segments where you’re on camera after the animated story and you’re sharing with parents how they can take what their children have just learned and expand on it in different ways. Well, we have 30 minutes of animated content broken into 7 ½ minute segments each—remembering that this is for the three-, four-, five-year-old age group that doesn’t have the longest attention span. So even though it’s a complete story, it’s broken down within each segment. So we thought what a wonderful addition would be maybe for me to create a segment called “Life Lessons with Roma.” And it’s me direct to camera [helping parents in] finding ways to engage imaginatively with your preschooler, finding maybe opportunity throughout your day to see the shapes of things, objects around your house, and to recognize that some of them look like the shapes of letters which is how the little angels choose to teach the ABC's. They look around the nursery, and they see the corner of a picture frame looks a little bit like a “T” or the tripod for the camera looks like an “A” or the Bible put on its side and when the pages spill open a little bit it looks like a “B” and so on. And so I have fun engaging other ways of doing other games that you can play with your children and also finding ways to deepen the lessons taught. Our little character Zoe has certain fears. She’s afraid of the dark. She’s afraid of the top bunk. And so I also address that in the little life lesson that if your child feels that they have little fears about things, [there are] ways to lovingly reassure them and ways to make them feel safe and so on. Do these “Life Lessons” segments help Little Angels stand apart from other faith-based educational DVD series? Well, you know I don’t really feel that there’s anything quite like this in the marketplace, and it’s teaching the kids almost on three levels. It’s teaching them these practical skills that they’re right at the age to learn. And so through repetition, which is how children learn, we’re teaching the alphabet. We’re teaching them to count. We’re teaching them to recognize and to name the animals. Level two is that we’re introducing them to beloved Bible stories, both Old Testament and New Testament, through this device that we’re able to leave the nursery and time-travel back into our Bible. And we know that as children are introduced to these stories at this age that the resonance will remain with them their whole lives. And then the third level, I think, is just as parents that you would know that you could trust this show not just for content, not just for entertainment values, but that it supports the value system that you’re teaching at home because it’s encouraging children to be good citizens of the world with the skills that we’re going to need—what we call traditional Christian family values. And I know having raised my own family that you’re just so grateful when there’s a product that supports that because we all need all the help we can get. And as a working mother myself, I know that there were times where I was glad to sit my kids down in front of the DVD to buy myself time to deal with a phone call or paperwork that I had to take care of or a plumber emergency and so on. And how wonderful is it to know that if you’re going to be setting your child down anyway in front of the DVD wouldn’t you rather sit them down in front of something that you know is good—not just for their mind but good for their heart and their spiritual well-being. So I don’t think there’s anything quite like this, and it’s just turned out so well. But through www.littleangels.com you can check it out for yourself and see how beautiful it looks and what a quality product it is. It sounds like this series can be more of a supplement to an educational/spiritual training system that families already have in place in their homes. We’ve designed it to add value to your family. It’s not that it’s that long, but what I think it’s also going to allow is conversation with your child to use as a springboard into deeper conversation. Once the child has watched the DVD, it opens up an opportunity to discuss the various Bible stories to maybe in a fun way say, “Well, if you could go visit anybody else in the Bible who would you love to visit and what would you say to them if you met them.” Your child is never too young to begin the conversation of letting them know that God loves them and letting them know that Jesus cares for them. I think this just allows, in an age-appropriate way, an introduction to those conversations. There are also some fun songs that can help plant good lessons and spiritual truths in little minds. There are a few of the songs in the DVD, but we’re also offering Little Angels CDs with all kinds of fun and beautiful music—great music that kids sing along in the car with. And some of the lyrics are just deliciously goofy, and I think the kids are just going to get a kick out of it. And I defy you to hear a few of them and not to have them stuck in your head all day long. That’s a great point. It seems that you all have really figured out how to get on a young child’s level and connect with them, especially with all of the imagination of Alex’s and Zoe’s nursery and then the catchy melodies that preschoolers really seem to love. I know! All of us involved, starting with myself, have raised children. I only wish Little Angels had been around when my kids were small. I think I could have used all the help I could have gotten. But I am happy to say that on the musical CDs my own children are involved. And my oldest boy is a very fine musician, and he’s played guitar for me. And my daughter is a beautiful singer, and she has sung a couple of the tracks on there for me. So that makes it very meaningful that we were involved as a family. How great! A family making something together to help other families in a fun way. I think it’s fun, but it has substance. I encourage people to go to www.littleangels.com where you’ll find Little Angels on Facebook, and I’m also on Twitter @RealRomaDowney if anyone wants to follow me, and I’ll be updating anyone about Little Angels there. Twentieth Century Fox Home Entertainment will release the first two Little Angels DVDs on November 1, 2011 to the Christian market. For more information about Little Angels or Roma Downey, please visit www.littleangels.com.